The traditional music and instruments from the Russian province of Tuva come to Lawrence University’s Stansbury Theatre Monday, Sept. 26 at 8 p.m as the acoustic quartet Huun Huur Tu opens the college’s 2016-17 World Music Series. Tickets, at $10 for adults, $5 for seniors/students, are available through the Lawrence University Box Office, 920-832-6947. Free to Lawrence faculty/students/staff. The performance features musicians deeply rooted in the art of Tuvan music. Huun Huur Tu specializes in throat singing, a unique singing style that is popularly practiced throughout East and Central Asia, as well as in northern Canada and South Africa. 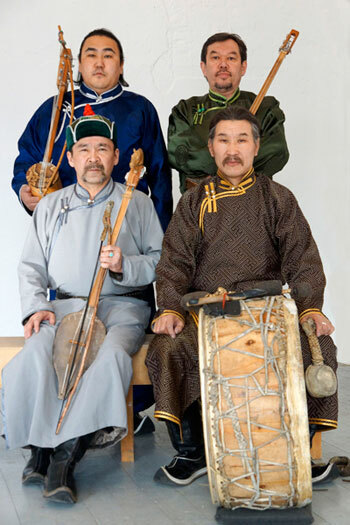 While throat singing is usually performed acappella, this program celebrates traditional Tuvan music with the addition of traditional instruments. The power of human voices form eerie overtones producing a meditative, evocative sound straight from the avant garde. Using traditional instruments such as the igil, Tuvan jaw harp and dünggür (shaman drum), and drawing subtly on 20th-century composers, Huun Huur Tu transforms ancient songs into complex acoustic compositions. Founded in 1992, Huun Huur Tu has released 15 albums, including “Ancestors Call” and “Legend” in 2010.